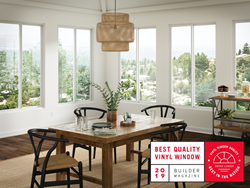 “It's a recognition of our product design, rigorous manufacturing process and our employees’ dedication to produce the finest quality windows and doors,” said Jeremiah Noneman, senior marketing director at Milgard Windows & Doors. Professionals rely on the annual BUILDER Brand Use Study to learn about trends and top brands. Milgard extrudes its own vinyl components and manufactures its vinyl windows in house to keep a close eye on quality. Milgard products undergo exhaustive testing and adhere to strict requirements to meet third party certifications for performance. The BUILDER Brand Use Study surveys qualified builders, developers and general contractors who are asked to rank quality, usage and familiarity of different brands across over 50 building product categories.